Wells in Thornbury were much used and greatly valued. The wells often went dry during long hot spells and were easily polluted. For this reason it was an offence to waste the water, misuse the wells or vandalise them. The Court must have had a culprit or instance in mind because one particular well was mentioned. In this instance it was in the High Street “near unto Bell’s Cross.” This is likely to be near what is now the Bank on The Plain in the High Street. (NB This refers to the actual well which was on what is now the pavement outside the bank and not the pump which was in the centre of the highway). This is an interesting use of the term “Bell’s Cross” which was believed to be on the Plain near St John Street but seems to be a general term for the area of The Plain. The Court Order also makes it possible to get a picture of some of the trades carried out in Thornbury at this time that needed a plentiful water supply as people were forbidden “to brew ale or beer with all or any tanner for his tan pits except licence be given him.” The penalty for breaking this law was a fine of ten shillings for every offence. The fine for each offence of that sort was two shillings and three pence. There were other public wells in Thornbury. 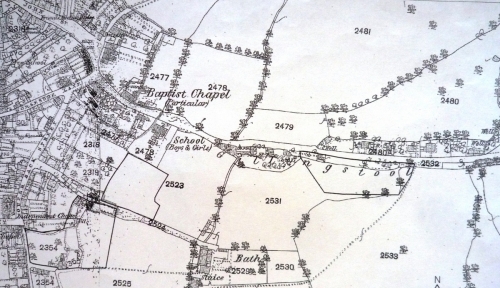 Those marked on the map of 1881 include one located at the Castle and as can be seen in this extract on the left at least three others along Gillingstool on the left hand side just outside the old Borough of Thornbury. This shows that the wells were more likely to have been dug in the areas just outside Thornbury itself – presumably because of the notorious Thornbury rock. We know the site of some of the wells. An advertisement of 15th August 1840 requests tenders for boring a new well at the workhouse. The original well there was said to be 40 feet deep. The Workhouse had been opened at the site in Gloucester Road by 1840 but already the well was insufficient. The wells continued to be used for some considerable time. The Gazette of 1937 had an almost comic account of the well in Thornbury Cemetery. The well had been dug the year before and was 35 feet deep. There was a rotary pump to raise the water from the bottom of the well into a tank. Unfortunately the pump seems to have been ordered before the well was dug and the well had to be deeper than expected. The pump could not reach the bottom and so a platform was built 18 feet below the surface. The caretaker of the Cemetery had to go down a ladder to pump the water for the tank. If the ladder was placed straight, it moved from side to side of the well as the man descended. If the ladder was placed at an angle to make it more stable the well was so narrow that the man could not get down the last few rungs. The ladder then had to be moved out of the way so he had room to use the pump. A subcommittee reported on this situation to to the Parish Council. The chairman of the Council Mr A C Pitcher felt there was an unnecessary fuss about about this method of working as the caretaker had never complained. The vote went against the chairman and the Council decided to get prices for a new pump. It is not recorded whether they actually bought one.